Have you ever spent long frustrating day in office, consumed in logging data into a spreadsheet, pasting emails into your customer relationship management software or trying to create simple graphics with complex design tools? Every sales manager faces this time at least once in his/her life. This is why in the current era of technology, most of the organizations adapt advanced web-based sales management software – a foremost tool that can remarkably improve sales practices and performance of any business. Before moving further, we need to be aware of some certain aspect to dig deep into the insights of sales management software. Sales management is a crucial business process – designed to make a great focus on the interaction with prospects and customers that help the business to easily analyze the exact need of the customer to enhance the business revenue. This is a cutting-edge approach to find business opportunities, forecast revenue, analyze team performance, and to get an overall framework to carry out the aforementioned activities effectively. In the current business scenario, accuracy is the most important aspect whether it is in analyzing the need of customer or in the execution of business activities. This accuracy can only be achieved by adopting the latest technology trends. As the sales are the most prior aspect of any business, every organization have to manage the exact data of their sales and revenue generated with the sales. To achieve this accuracy, innovative web-based sales management software comes in play to conquer all challenges for automation of the business sales. Sales Management Software : A sales management system is a modern approach to implement an organized work structure to the whole business process. It is usually tied to a system like CRM software that makes the sales team able to address the challenges of business sale’s process. It is a professionally designed system – helpful for any business to get in touch with a web of multiple tools to manage customers, communications, opportunities, analytics, and much more. Why Web-Based Sales Management Software? Compare to other applications whether it’s desktop based or mobile application, web-based applications has been one of the prime choices before implementing a sales management software for any business. It renders numerous advantages to the business – helpful to effectively run the whole business process. Customer Relationship Management – Its a main highlighted benefit of a web-based application for the business as it serves the real-time information for every user which can be accessed with few clicks to understand the past purchases done by the client. Also, in the case of return and exchange of transaction – for better customer relationship management, can be easily done with real-time data. Reduced Paperwork – Web-based software stores your data in the cloud and are able to integrate with different work as someone have multiple store and branches the whole data is accessible by common authorized bodies in order to decrease the paperwork and huge document issue to make the accounting process of your business extremely smooth. 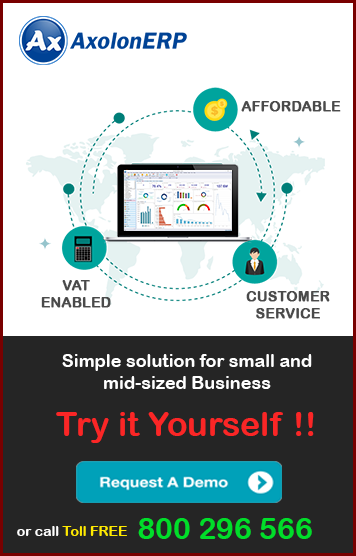 Easy and Accurate Business Forecasting – This business keep-safe the entire data of your sales, profit, loss and customer activity as well. This critical data helps the business to make accurate forecasts for future activities. Secure and Easily Accessible Data – The cloud base data ensure the security of entire business data – required to monitor every detail of your department even if you are at any location, you are still connected to the organization. 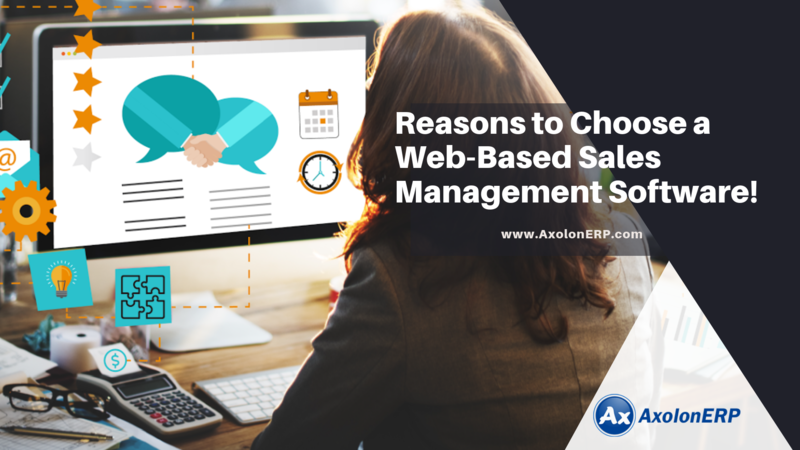 At AxolonERP, we offer one of the leading web-based sales management software that is already available with a set of innovative features. Our strong sales reporting and analysis tools give you the insight to evaluate your sales and sales team.